The principal method of learning either design skills or machine operator skills of roll form tooling and its design has been on-the-job training. 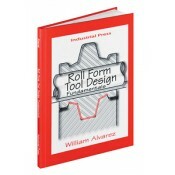 As the only book of its kind available on the subject, this insightful and handy reference acts as a supplement to on-the-job-training by presenting the fundamentals of roll tool design through theory and illustrative examples which include detail of the design calculations. Additionally, it identifies design decisions that are judgment calls and have no correct answers in design examples that depict certain ideas and conceptshelping users develop a feel for the process. It is sure to be useful as a teaching aid for setup personnel and roll form machine operators, as well as a basic reference for tool design personnel. • Uses design examples together with detailed analysis and calculation so that the user can easily see and follow the design process to conclusion. • Contains a formula that makes it possible to calculate pure bend allowance for any arbitrary combination of material thickness, inside radius, and angle of bend. • Serves as a framework which can be expanded and modified to suit the requirements of a particular industry.